I planted them out in a raised bed in March. They looked so tiny, that I thought the slugs and snails would devour them overnight. As a precaution, I covered the surrounding soil with broken egg shells to deter the munching molluscs. Apart from watering them, they have just been left to get on with it. Nine months later and they are still there, uneaten by the bugs. So on Saturday we made a trip to the allotment to harvest them with Magoo. 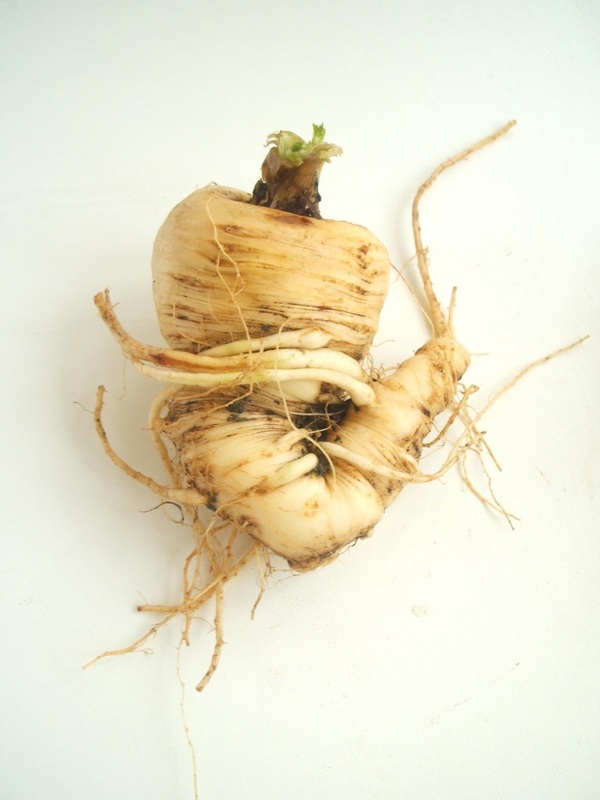 Now I know people who are experts at growing vegetables will be horrified by my curly parsnips. On reflection, I think they should not have been grown in a raised bed. We didn't prepare the soil very well in our raised beds this year. 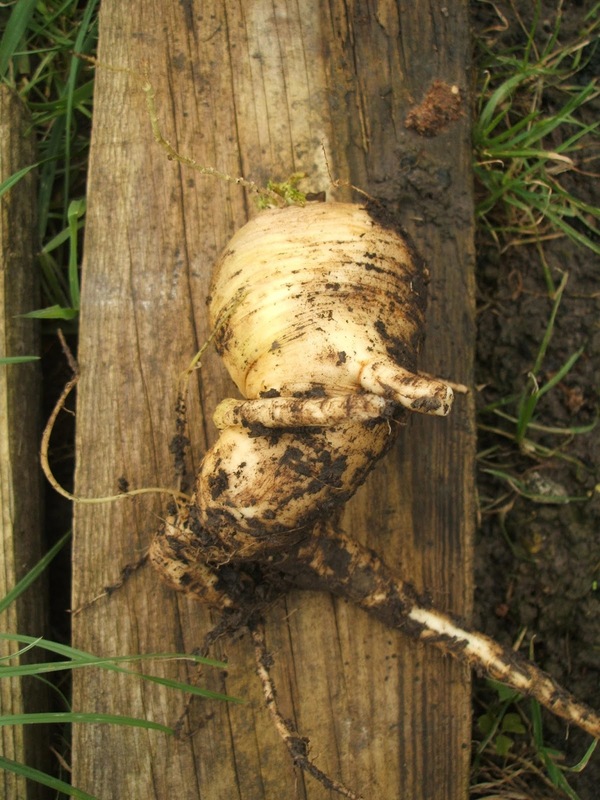 I know that when root veg hit something hard like a stone, they grow away from it and end up twisted. A few weeks ago I was watching Hugh Fearnley-Whittingstall's War on Waste. They highlighted the mountains of vegetables rejected by supermarkets because they aren't 'perfect'. 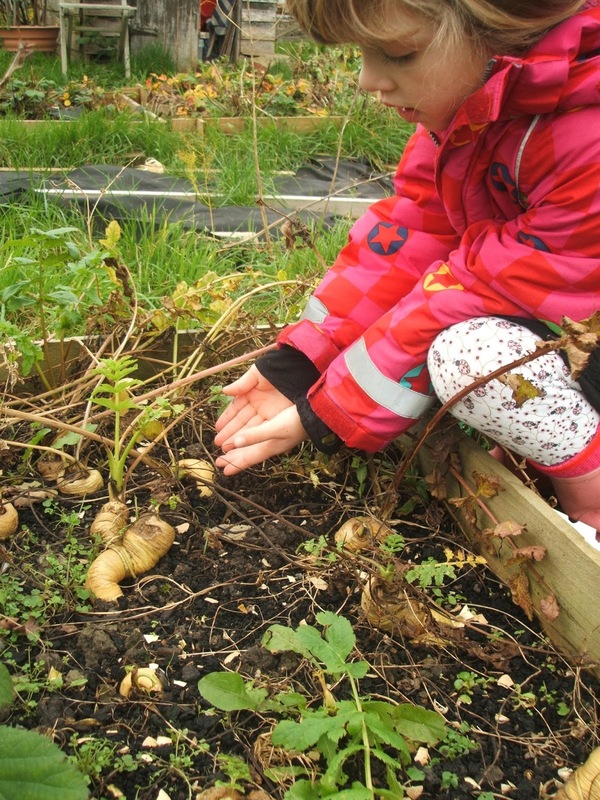 In particular, they visited a farmer who grew parsnips. This particular Norfolk farm had to bin 20 tonnes of freshly dug parsnips because they were deemed 'wonky'. I think if a supermarket buyer saw my parsnips, they would pass out. We've all been trained by the supermarkets to expect our veg to be free from mud and perfectly formed. 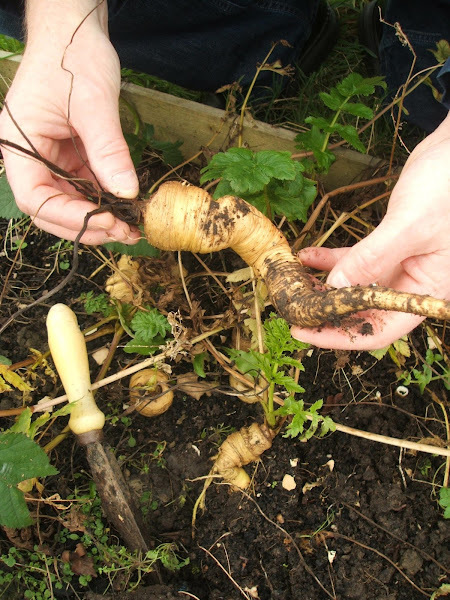 Some of the things we grow on our allotment are pretty odd looking, but shouldn't it be more about what things taste like? 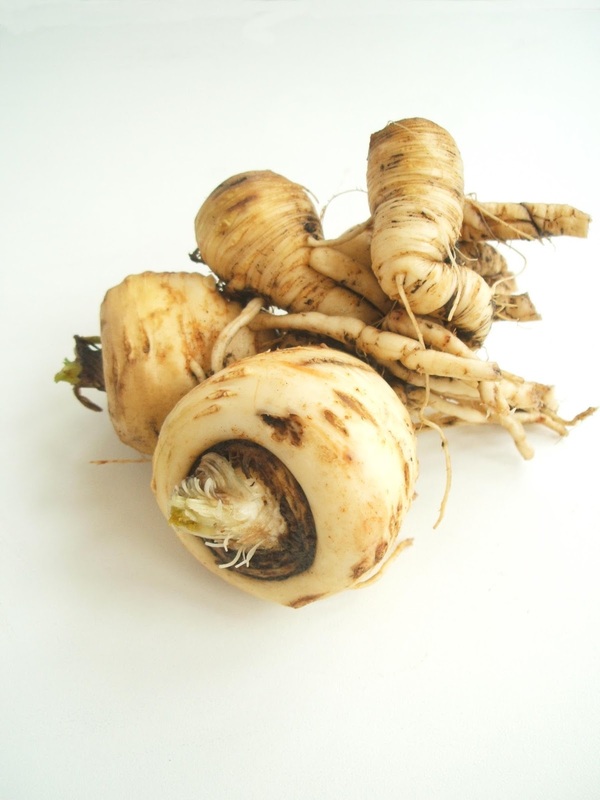 I haven't been put off growing parsnips. In fact, I will definitely be planting more next March. This time we will dig a deeper trench in the main beds of the allotment. This will give the parsnips a chance to grow bigger. I'm not bothered about the shape of them, but it would be nice to have some larger ones. Having said all that, I am proud of my first crop of parsnips. We roasted them last Sunday and ate them with some slow cooked beef. And do you know what? They tasted bloomin' delicious. growing anything for me is such a happy and rewarding feeling. yay parsnips! Enjoy those in all their curly glory! We had a similar experience with the carrots in our raised beds. The year after we dug it all over really deep and they were all ok the next year. They are perfectly yummy though and like you say so much food is wasted because things don't look 'perfect'. As an ex buyer for Tesco in produce I'm well aware of the silly rules on vegetable specification, i love your curly parsnips. when I'm shopping I always go for value veg,it is only value because it is misshapen which isn't something I mind. Love the photo of Magoo helping you on the allotment and I hope you all enjoy your wonderful parsnips. Well done with the parsnips. They are very wonky, but it really doesn't matter what shape they are, it's all in the eating and I bet they tasted great. These look brilliant, well done! I think your parsnips are beautiful...they would be extremely fun to paint faces onto... That's the artist in me talking, though! We've just got our allotment but my husband's plan is to grow our Christmas dinner for next year. Wonky veg is the best veg!